Electronic Cigarettes (e-cigs) and other “vaping” devices (such as JUUL or Suorin) are battery-operated products designed to deliver nicotine, flavor and other chemicals. They turn chemicals, including highly addictive nicotine, into an aerosol that is inhaled by the user. Most e-cigs are manufactured to look like conventional cigarettes, cigars, or pipes. Some resemble everyday items such as pens and USB memory sticks, and are known as tanks, vape pens, vaporizers, and e-pipes. National Academies of Sciences: A new congressionally mandated panel from the National Academies of Sciences, Engineering, and Medicine examined more than 800 peer-reviewed scientific studies. In its report, the panel concluded that evidence suggests that while e-cigarettes are not without health risks, they are likely to be far less harmful than conventional cigarettes. Vaping devices contain fewer numbers and lower levels of toxic substances than conventional cigarettes, and using e-cigarettes may help adults who smoke conventional cigarettes quit smoking. However, their long-term health effects are not yet clear. Among youth — who use e-cigarettes at higher rates than adults do — there is substantial evidence that e-cigarette use increases the risk of transitioning to smoking conventional cigarettes. A study in the Journal of the American Medical Association found youth who vaped e-cigs were nearly 4 times more likely to smoke. Current use of electronic cigarettes increased among middle and high school students from 2011 to 2015. About 5 of every 100 middle school students (5.3%) reported in 2015 that they used electronic cigarettes in the past 30 days—an increase from 0.6% in 2011. 16 of every 100 high school students (16.0%) reported in 2015 that they used electronic cigarettes in the past 30 days—an increase from 1.5% in 2011. JUUL is a type of e-cigarette that has surged in popularity since its introduction in 2015. It is known for its unique use of nicotine + benzoic acid + flavors that deliver a smoother experience than other vaping devices while mimicking combustible cigarettes in their delivery of nicotine. JUUL is already the most widely purchased e-cigarette brand, representing nearly half of the market share in the last quarter of 2017. JAMA: E-cigs are associated with 2 factors of cardiovascular risk, according to a February 2017 paper in JAMA. Meanwhile, according to the FDA, combustible cigarettes contain more than 7,000 chemicals. Poison Control: Meanwhile, poison centers are reporting an increase in calls about exposures to e-cigarette devices and liquid nicotine. In 2014, there were 3,783 exposures, according to the American Association of Poison Control Centers. In the first three months of 2015, there were 975 reported exposures. During January 2010 to October 2015, a total of 98 e-cigarette exposure calls were reported in Wisconsin, and annual exposure calls increased approximately 17-fold, from 2 to 35, according to the Wisconsin Medical Journal. The frequency of e-cigarette exposure calls to the Wisconsin Poison Center has increased and is highest among children aged ≤5 years and adults. Does vaping lead to quitting smoking? According to a Cochrane review of published research, it is unclear if e-cigs are an effective way to quit smoking. In a UW-CTRI study, vaping can reduce nicotine dependence, but it is unclear if patients would quit vaping. A British study published in the New England Journal of Medicine found similar results. In its report, “Nicotine Without Smoke: Tobacco Harm Reduction,” the Royal College of Physicians in the United Kingdom recommended promoting both quit-smoking medications and e-cigarettes as a way to help people avoid the harms caused by smoking combustible tobacco products. The FDA has not made such recommendations. How many vape? According to the CDC, 3.5% of U.S. adults vape. A survey from the Action on Smoking and Health released in May 2017 found that more than half of British vapers were former smokers. These results were reported by the individuals and not confirmed with tests that can biochemically check smoking status. In addition, 1.3 million British residents surveyed reported they both smoke and vape. Research continues. UW-CTRI is conducting its second study on smoking and vaping. The first UW-CTRI study on smoking and vaping found no clear evidence that vaping e-cigs reduced smoking or lowered carbon monoxide levels in participants. The second study did find that dual users of e-cigs and regular cigarettes smoked fewer cigarettes per day, but were taking in the same amount of nicotine. 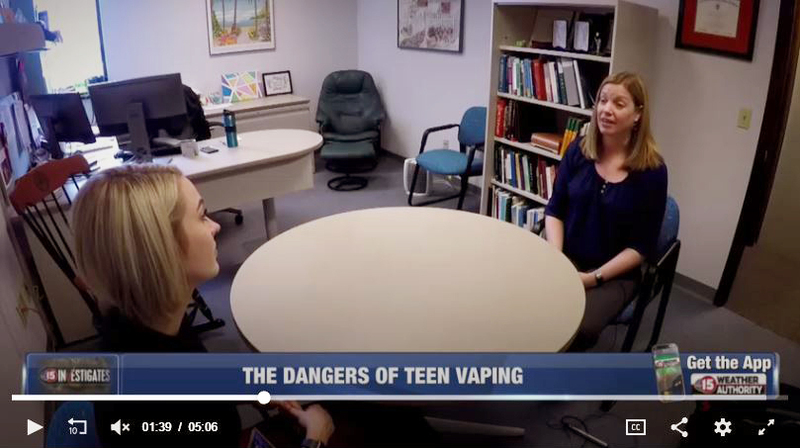 UW is also conducting a study on the acute and long-term effects of vaping. Regulation: On May 5, 2016, the FDA asserted authority to regulate all tobacco products, including vaping devices. On August 8, 2016, those regulations took effect. However, those regulations are still under debate and could be changed. To view a list of vaping regulations by state, click here. 1) WHO 2014 Report on E-Cigarettes. Conference of the Parties to the WHO Framework Convention on Tobacco Control, Sixth session, Moscow, Russian Federation, 13–18 October 2014.